Hello friends! 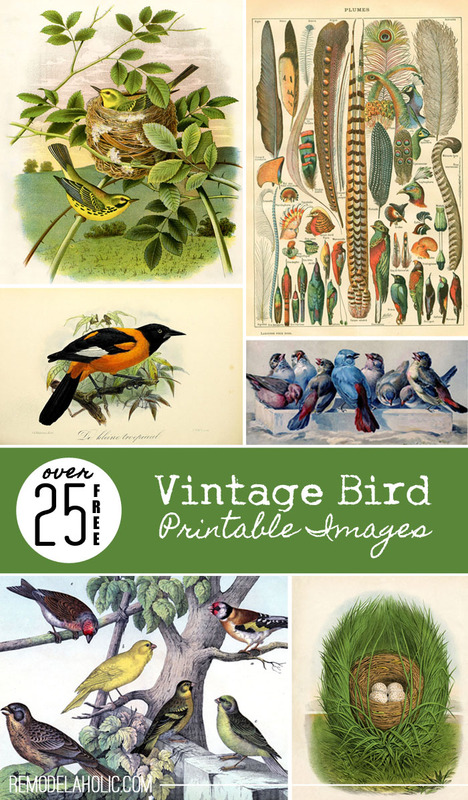 Brynne, here, from The Gathered Home with another roundup of fabulous free vintage printables and inspiration! There were just too many to include them all, so I had to select my favorites. Consider them the “X” on a pirate’s map – if you dig here, you’ll find buried treasure! 1. Blow up an image or two and frame as a focal point in the room. Check out my tutorial for enlarging vintage images! 3. Mix smaller vintage butterfly/moth prints with other natural history themed objects to create a stunning gallery wall. 4. No butterflies were harmed in this project – get the “butterflies behind glass” look with this “vegan” tutorial! While you can print these vintage images at home if you have a color printer, you can also have them printed at either a local printing place or an online printing shop – the price will be very affordable for smaller standard sizes like 8 x 10″, 5 x 7″ or 8.5 x 11″. To download and print, click on each link to visit the original source for each image. I hope you’ve enjoyed these gorgeously detailed vintage butterfly and moth images as much as I enjoyed pulling them together! Isn’t nature just incredible? Thes are beautiful and would love to use these in my home. How would I purchase them? Hi Pauline – all the butterfly and moth images in this post are actually free to download! The links can be found above each image. If you visit the link, you’ll be able to find download instructions there. For the images in the Flickr galleries, the download arrow will be found in the lower right beneath each image. Enjoy!